Dribbling is what we call moving the ball with our feet. The purpose of dribbling is to move the ball from one spot on the field to another. 1. Keep the ball under control. 2. Keep the ball close to his feet. 3. Be able to quickly change directions. 4. Be able to quickly change the pace (or speed) the ball is moving. 1. Keep the ball until a team mate is in a clear position to receive a pass. 2. Get past a defender to assist in an attack. 3. Clear himself for a shot on goal. 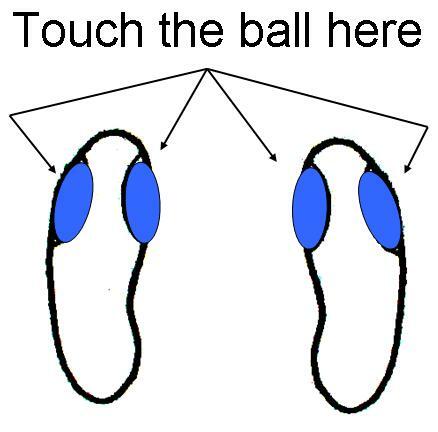 The ball should be touched on the side of the toe using either the top, inside, or outside of the shoe. Dribbling Slow. Dribbling slow allows for a greater amount of control over the ball on each step. Dribbling Fast. Dribbling fast allows the player to move quickly across the field. The player will touch the ball on every two or three steps. Don’t hit the ball hard. Hit it sharp and quick. Work on having a light touch to keep the ball moving. Remember to stay not more than one step away from the ball at all times. When dribbling, it is important tokeep the ball close to the player to prevent the other team from stealing the ball. Be aware of your surroundings. While dribbling, watch the ball and watch the field. Remember to keep the ball moving.